CH Cyg is a "symbiotic" star system in which a white dwarf feeds from the wind of a companion red giant star. The inset shows a powerful jet in CH Cyg that is moving at over 3 million miles per hour. The detailed structure of the X-ray jet is seen for the first time in this system, showcasing the superb high-resolution capabilities of Chandra. This image shows the symbiotic system known as CH Cyg, located only about 800 light years from Earth. 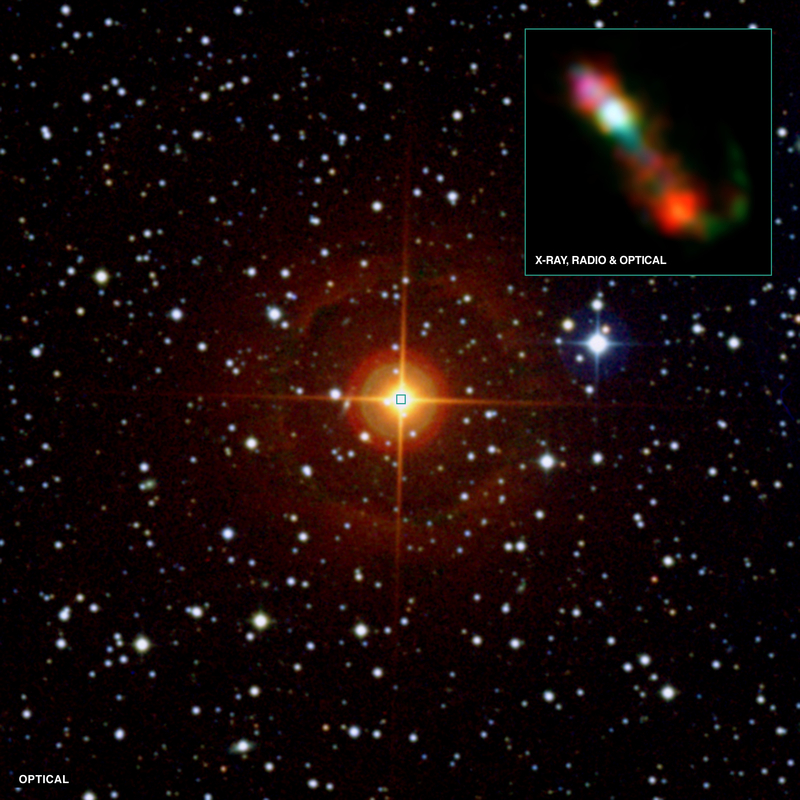 The large image shows an optical view of CH Cyg, using the Digitized Sky Survey, and the inset shows a composite image containing Chandra X-ray data in red, optical data from the Hubble Space Telescope (HST) in green, and radio data from the Very Large Array (VLA) in blue. CH Cyg is a binary star system containing a white dwarf that feeds from the wind of a red giant star. The material from the wind forms a hot accretion disk around the white dwarf before crashing onto the star. CH Cyg is one of only a few hundred symbiotic systems known, and one of the closest to the Earth. Symbiotic systems are fascinating objects, where the components are codependent and influence each other's structure, daily life, and evolution. They are likely progenitors of bipolar planetary nebulas and they could make up some of the systems that later explode as Type Ia supernovas, spectacular explosions visible across cosmological distances. The image in the inset shows a recent powerful jet in CH Cyg, caught in action by Chandra, HST and VLA. The material in the jet is moving with a speed of over three million miles per hour and is powered by material spinning in the accretion disk around the white dwarf. The detailed structure of the X-ray jet is seen for the first time in this system, showcasing the superb high-resolution capabilities of Chandra. The curved appearance of the jet, shown in the optical by the green arc in the lower right part of the inset, reveals evidence that the direction of the jet rotates. This precession may be caused by wobbling of the accretion disk, in a manner similar to a spinning top. Clumps in the outer jet, seen in X-rays, optical and radio data, provide evidence for powerful mass ejections by the jet in the past, and for interactions with shells of gas formed by the red giant. The jet can be seen as close as 20 astronomical units (AU) from the binary system, where one AU corresponds to the average distance from the Earth to the Sun. The jet extends out to distances as large as 750 AU from the binary, which is about 20 times the distance between the Sun and Pluto. The shape of the jet in CH Cyg shows striking parallels with jets seen in very different astrophysical contexts, such as young stars or supermassive black holes located at the centers of galaxies. Because of its proximity it may be used as a "toy model" to study jet formation and propagation in much more complex and distant systems. In a biological setting, "symbiosis" was originally defined as the "living together of unlike organisms," and describes close and long-term interactions between different species. In this sense, the astrophysical usage is apt because white dwarfs and red giants are very different stars. A red giant is extremely large and bright, with a relatively low temperature, while a white dwarf is small and faint with a high temperature. Symbiosis is usually beneficial or essential to the survival of at least one of the species in the system, for example bees and flowers, birds and rhinos and clownfish and anemones. In the astrophysical context of symbiotic systems, the survival of the hot disk around the white dwarf, where the jet originates, depends on the wind of the red giant. The power, mass and the speed of the jet is closely related to the white dwarf environment including the disk. Once formed, the jet disrupts and shapes the extended envelope and environment of the red giant, as the latter evolves toward the end point of its life as a planetary nebula. However, in some cases, if the white dwarf gains too much mass from the red giant, it may end up being completely destroyed in a spectacular Type Ia supernova explosion. A paper describing the new observations of CH Cyg was published in the February 20, 2010 issue of the Astrophysical Journal Letters and was led by Margarita Karovska from the Harvard-Smithsonian Center for Astrophysics (CfA). The co-authors are Terrance Gaetz from CfA, Christopher Carilli from the National Radio Astronomy Observatory, Warren Hack from Space Telescope Science Institue, and John Raymond and Nicholas Lee, both from CfA. Scale Inset image is 6 arcsec across (0.02 light years across); Wide field is 12 arcmin across (3 light years across). Thanks for your question. The masses of the two stars in CH Cyg are much closer to each other than the mass of the Earth and Moon are to each other. I have seen a published factor of about 3 difference in mass. Given that the separation between the 2 stars is about 9 astronomical units and the mass-losing star is a M6-7 III red giant (with a large radius) with a mass of about twice the Sun, I leave it as an exercise to work out where the common gravitational center would be. In a binary system like this where would the common gravitational center be? Would it be somewhere below the surface of the larger star something like the Earth Moon system? It's really interesting. My all the best wishes to the team working for this task, hope to see more news in future. I'm particularly interested in double star systems and Globular clusters. CH Cyg is very interesting and I always enjoy the images and text that comes from Chandra. I have studied Subramanyan Chandrasekhar and taken a deep interest in the Chandra Observatory ever since it was launched. Occasionally I give a public talk on the observatory and how it attains it's images. I only have Chandra videos as back-up to my talks and they are now obsolete. I want to get some more modern DVD's. Do you know where I can get some from?